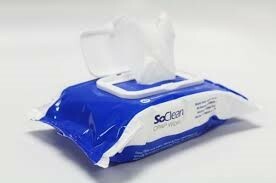 SoClean CPAP Wipes are all natural, 100% cotton. They remove dirt, grease, oils, and other organic residue from your CPAP mask and equipment without the use of harmful chemicals. These unscented wipes also contain a special plant-derived formula that cleans and nourishes your hands while cleaning your mask. I’m interested. How do I purchase SoClean CPAP wipes? SoClean CPAP Wipes are $9.99 per pack (62 wipes in a pack).